9 Facts about Purim That Will Let You Tackle the Holiday’s Core Message—My latest on @TimesofIsrael What is the main message and meaning of #Purim ? It’s a story about Jewish unity. 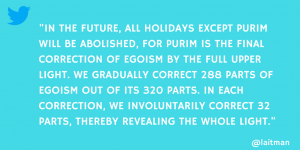 The connection between Purim and egoism. Follow me on Twitter for more #Purim tweets. Question: What does it mean to manage spiritual life? What is there to manage? Answer: Managing spiritual life means gradually strengthening connection between people until they begin to reveal the upper force, the Creator, between them. Question: How do Kabbalists benefit from unity? Answer: The benefit is huge, in fact, it is the highest! We can reveal a new form of life in Kabbalistic unity! We can travel between galaxies, rise above our universe, go beyond it and beyond the material life we exist in now. We can feel ourselves living outside the body. This is possible and achieved through the right connection between people. Question: Is this unity similar to how cells are connected when a single-cell organism becomes more perfect? Answer: No. If we unite through the type of cells, then we create the right egoistic society, as in the present society. It functions well egotistically, but it does not rise to the next level. 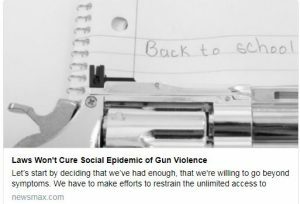 We need to reach a state where, as a body, we will support ourselves in reciprocity so that we are governed by one force, one brain, and one heart. For this, we need to rise above our own egoistic nature. During this life, we have to reach the next level, and this cannot be achieved by any ordinary tricks. We must put ourselves in a special state while in our earthly state, where we attract the upper Light. It will then pull us to the next step, and then to the next one, and so on until we rise above our world. In our world, we need to sustain a minimal level in order to exist because all our thoughts and aspirations should be directed at the revelation of the upper world. Where Is The Upper World Revealed? 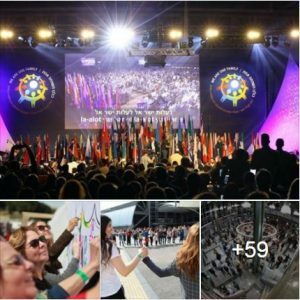 Question: What kind of spiritual benefit can there be from the talks, discussions, and disputes of a group of people who have begun their journey in the wisdom of Kabbalah but are not in spiritual attainment? Answer: People need to try to find a common language, to unite, to understand how different they are, what they can do to come closer to each other, and help each other mutually. They need to talk about this a lot, to study the books of Kabbalah, and to organize common meals, as we did with my teacher Rabash. Every week in addition to learning, we would gather in the evenings and read his articles, and sometimes we would travel to different places as a large group. In other words, this was a complete system of exercises that functioned on two levels. One level was indeed completely physical, psychological, and amiable: we would simply get together and get to know each other. We needed to do that. It is relevant to both groups of women and groups of men. A second level is learning about our relationships and connections, but on a deeper level we don’t yet feel, like the workings of parts of the soul, or a spiritual system, or a Partzuf; it doesn’t matter what this is called. If ten friends achieve an inner connection, then a system is created between them called a Partzuf (spiritual body) or a Kli (vessel) composed of ten parts, ten desires, connected correctly, and a unique force called the Creator starts becoming revealed. Ten people together feel and discover it. This is called the discovery of the upper world. The power of the Creator manages them, guides them forward, and changes them and all the circumstances that are around and within them. He teaches them. The moment they discover Him, He immediately begins to work with them. All the transformations that happen with them are multifaceted. Even if they seem to negate and contradict each other, at the same time, they still help, integrate, and the group of ten gradually ascends. The friends feel the contradictions between them more and more, and yet, the force that connects them becomes greater and greater. It is particularly when faced with great opposition or in parallel with them that we start discovering a general integral connecting force. Between the two forces of rejection and attraction, a spiritual sense organ, called “a soul,” is created. It begins to teach them, as it is said, “A person’s soul will teach him,” and they follow it. In this way, everything is resolved the connection among the people, not only in the group of ten. The more there are such groups of ten, and the more they connect with each other, the better, because the whole of humanity must reach such a connection. That is how the upper world is revealed. It cannot be revealed in any other way. We can only make discoveries of the upper world in the connection between us, because we all emerged from system of Adam that shattered, and which we must restore. The meaning of the month of Adar is in overcoming thoughts & desires arising in man against the Creator, His #singularity, which distances from Him. It’s necessary to see obstacles as sent by the Creator himself – to give one an opportunity to come closer to Him in spite of them. Preparation for #Purim – awareness of ego’s evil nature, Haman, ready to kill anyone wanting to unite to be similar to the Creator, the quality of bestowal & love. But there is no strength to resist Haman. Find who dominates you, Haman or Mordechai, and accept Mordechai’s power. 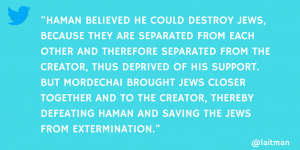 Haman believed he could destroy Jews, because they are separated from each other and therefore separated from the Creator, thus deprived of His support. But Mordechai brought Jews closer together and to the Creator, thereby defeating #Haman and saving the Jews from extermination.